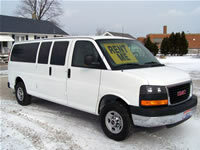 All cars are midsize 4 door, automatic, air condition, power windows, locks, mirrors, AM/FM CD, room for up to 5 people. All SUVs are GMC Yukon XL's, fully loaded, power everything, front & rear heat & A/C, flip down video screen & DVD player. All Yukon's have seating for 8 people with room for luggage in the rear. The perfect alternative to the minivan. All minivans are Dodge Grand Caravans, fully loaded, power everything, front & rear heat and A/C, flip down video screen and DVD player, 4 captain chairs and rear bench seat, Stow-n-Go seating and power doors. Room for up to 7 people and luggage. 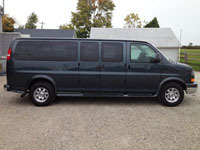 All luxury passenger vans are Chevrolet Express or GMC Savanas fully loaded, power everything, front & rear heat & A/C, AM/FM CD, dark glass, flip down video screen & DVD player. 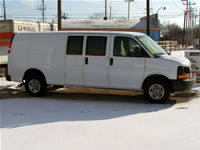 All luxury vans have seating for 6 to 13 people, various seating options are available with room for luggage. All cargo vans are GMC Savanas, all vans are heavy duty 3/4 ton extended length vans, fully loaded, power everything, AM/FM radio, cloth seats, rubber floor, steel cage to protect driver and passenger. We have a variety of truck sizes ranging from 10', 14', 15', 17', 24' and 26' trucks. All trucks are automatic, air condition, AM/FM radio, pull out ramps, room for 2/3 people. 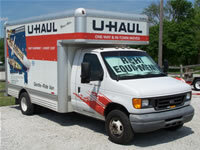 We have rates for both in-town moves and one-way moves. Call for pricing!